Donated to the 2012 Spring Auction by Leyla TORRES. Auction date: 11 May 2012. 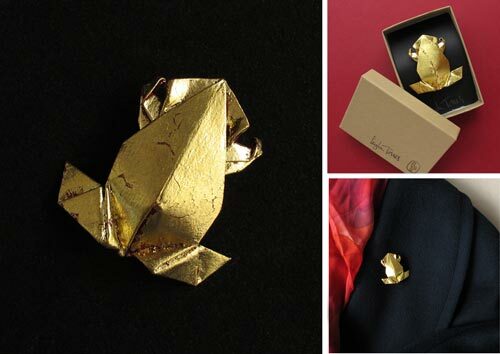 Description of Piece: This Pre-Columbian Styled Frog is folded from one square piece of sturdy Stardream red paper (3.5 x 3.5in) – no cutting. A natural clear glaze was applied and the frog was then gilt with 23K GOLD LEAF. A pin was applied to the back to be worn as a brooch.